Did you just jump on the WordPress development bandwagon and built some great plugins? You might have even submitted them to the WordPress.org plugin repository, so as to make the plugins available to WP community users. But plugin development is not a cupcake and you certainly would have invested in a lot of your time and effort in creating an exceptional plugin. And perhaps it may even solve some problem that you think others might pay to utilize it. Building a commercial plugin is a good thing, but in order to get maximum benefits from your developed product it becomes needful to pay heed to adding automatic update functionality in the plugin. Through this post I’ll be focusing on the importance of auto updates and how to enable auto updates. Plugins are the most crucial asset of a WordPress powered site. So, most (if not all) of the users interested in WordPress website development usually check out whether it contains automatic update functionality or not. One of the major drawbacks of WordPress powered sites are that they’re more susceptible to getting attacked by a hacker. So, if the plugin contains some security vulnerability, most likely the problem can be tackled with if auto updates are enabled. Well, you can easily term users as lazy if they resist hitting the auto update button in their WordPress site, but more than those users I bet you, the developer, is more lazy if you don’t embed the auto update functionality in your commercial plugin. Especially, when you’re charging for a plugin it’s worth making your premium plugin easy to use for the users. This will eventually make your customers happy with your product. And they might even recommend your product to their friends and acquaintances. You as developers can also benefit from the auto update feature. Wondering how? Well, you might be aware of the fact how users often hack premium plugins in order to fix certain issues of their WP website, instead of using it to update. But with auto updates you can lessen the hackage issue. How Can You Enable Automatic Updates? Easy Digital Downloads is a relatively new yet effective way to sell WordPress premium plugins. 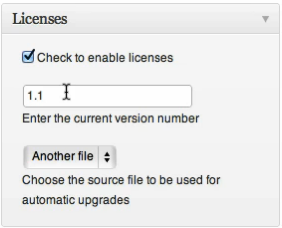 This plugin builds a license metabox for the products that can be downloaded. The metabox assigns a version to the downloadable product and match it to a corresponding file download, as shown in the screenshot below. The EDD extension provides a licensing management mechanism. On purchasing the EDD, its extension will create a license that can be activated by the buyer via their dashboard. WP Updates, is a new plugin that helps premium plugin authors to manage auto updates easily. As the name suggests, WP Updates offer an interface for commercial plugin developers, in order to upload new versions of their created products without much hassle. It’s available for only $9 per month for up to 10 products, and is available for free for just a single product. Both the above discussed plugins are available as free plugin on the WordPress.org directory, and will help generate more traffic to your premium plugins. If you’ve built a commercial WordPress plugin and want to sell it to the users, then it’s important that the plugin must perform auto updates. In order to enable auto updates, there are several plugins that can help you achieve this, so feel free use them to your advantage and get more traffic to your premium WordPress product. Jack Calder is an Editor and a WordPress developer at Markupcloud - HTML to WordPress service firm. In his free time, he enjoys culinary, surfing, exploring new places and spending time with his friends. Beside these, he always takes out time for writing and sharing content on web designing. Thanks so much for showing us how to reach and maintain a quality commercial WordPress product. These are very nice tips. Thank you. Great insight Jack. If you want the best out of your product, you need to offer the best to your customers! You’ve broken down the process so that it can be understood by anyone with minimal WordPress knowledge and experience. Great work and I will be sure to bookmark this as a reference for anyone who I come across that needs plugin insight.